Affordable At Home Medical Devices For Safety and Comfort! Take fewer trips to the doctor’s office and always keep your safety in tow with these affordable medical devices for use at home and in public spaces. Insulin Pumps for Diabetics – Insulin pumps are available now at affordable prices and with attractive looks and comfortable, waterproof styles so you can always have it with you. Omnipods are popular choices for many people including celebrities like Nick Jonas. If you have insurance, you’ll most likely be covered. Without insurance, the cost can be around $1000 to get started. Medical ID Bracelet – Medical ID bracelets are great because they can be customized to fit many different medical conditions. 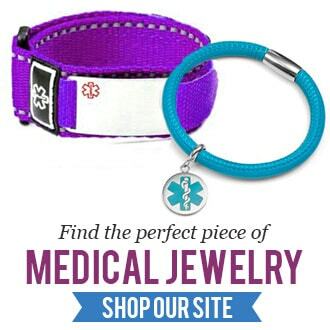 If you find yourself or a loved one in an emergency situation, a medical bracelet could actually save your life. Medical jewelry suppliers like StickyJ Medical ID will engrave custom designed medical ID tags with your unique medical safety instructions. You can find comfortable, durable, and fashion-forward medical alert bracelets with StickyJ Medical ID that range from $10 to $50 on average. Compression Socks – Compression socks are wonderous. Even people that don’t have medical conditions wear them because they’ve started making them with such cool designs and they just add an extra level of comfort if you work in the kind of environment which requires you to stand much of the day. If you have lymphedema, you may want to consider purchasing some of these socks to assist with swelling and discomfort in your legs, ankles, and feet. Compression socks will typically cost about $10-$40 for a pair. Asthma – If you have asthma, you know how useful it is and what a life-saver an asthma inhaler can be if you begin to have difficulty breathing. If your child has asthma and is embarrassed to carry their inhaler, it might help if you let them decorate with stickers! Asthma inhalers are covered by most medical insurance plans, however, if you’re self-pay you can expect to pay about $50-$100 for one. Epi-Pen – An epi-pen is used in case of emergency allergic situations. For example, if you’re allergic to bee stings and you find yourself in the unfortunate circumstance of getting stung, you’ll thank your lucky stars when you have your epi-pen in your possession to quickly assist yourself with, rather than risking being rushed to the hospital with only a small window of time to act. Unfortunately, the cost of the name brand Epi-pen will run you over $600, but you can get the generic option for closer to $300. Blood Pressure Monitor – If you have high blood pressure, then an at-home blood pressure monitoring system is a smart medical device to keep on hand – literally. Many fitness trackers these days come with blood pressure monitors built in. However, you’ll get more accurate results from using the standard arm tightening cuff to read your blood pressure levels. Either way, its smart to monitor it and there are affordable options available through online shops and retail storefronts. You can find at home blood pressure kits online for roughly $30. Research and purchase the best medical devices for your safety today. Keep in mind, you can use your health spending or flex spending accounts to pay for the cost of these medical devices.